Apple's watchOS 5 makes it easier to stay active and connected to the world around you in ways you choose. We are excited by the improvements to Apple Watch with the latest iteration of its watch software, watchOS5. New features include auto-workout detection, advanced running features, Activity Sharing competitions, Apple Podcasts integration and its ability to detect even life-threatening conditions via the Health app. Apple Watch usage has increased worldwide, taking the number one spot among smartwatch usage. When Apple offered cellular connectivity to the Apple Watch, making it independent of the iPhone, the results were dramatic. This was something we had wished for and were thrilled to see. Becoming independent of the iPhone was a huge accomplishment as the Apple Watch becomes its own independent ecosystem, offering a way to be Internet-connected without being tethered to a mobile phone. This makes physical activities such as running or using gym equipment so much easier and smoother, and overall creates a more seamless experience - so very James Bond! Adding cellular connectivity in Apple Watch Series 3 was huge for Apple, as it pushed Apple to the top of the wearables market in Q1 of 2018, according to IDC, a market research firm that closely tracks sales, revenue and growth worldwide. Smartwatch sales continue to grow worldwide by as much as 1.2 percent in the first quarter. During this same period, smartwatches like the Apple Watch and devices from Fitbit grew by as much as 28.4 percent while other wearables declined 9.2 percent. Apple sold 4 million Apple Watches worldwide, with 13.5 percent growth year to year, thus winning 16.1 percent share of the market, surpassing Xiaomi, the Chinese company that previously held the number one spot. Fitbit took the third spot, followed by Huawei and Garmin. In a Q2 investor call, T-Mobile CEO John Legere credited the Apple Watch and wearables as a whole with fueling new customer growth during the June quarter by as much as a lion for the quarter. T-mobile had 1.6 million total net additions and 4 percent revenue growth year-over-year for the period. At WWDC earlier this summer, Apple Vice President of Technology Kevin Lynch, lead the main watchOS5 demo. He shared that Apple has collected 6TB of data from 12,000 participants, logging 9000 hours and 2.3 million calories of biometric information, which he called "the largest biometric data collection of its kind." Apple has introduced more fitness tracking options to auto-detect workouts to start and stop workouts. Both yoga and hiking have been added as new workouts to Apple Watch, which we love, given our team and our locations in Colorado, Vermont, Norway and Switzerland. At Elf, we love fitness and are always looking for ways to improve, learn more and apply this knowledge both in our personal and professional lives. Using the Apple Watch has been part of this process for us. Athletic activity is big at Elf. :) In particular, skiing and snowboarding is a big thing for us and one of our upcoming apps is designed for the intermediate ski and snowboard enthusiast and athlete. 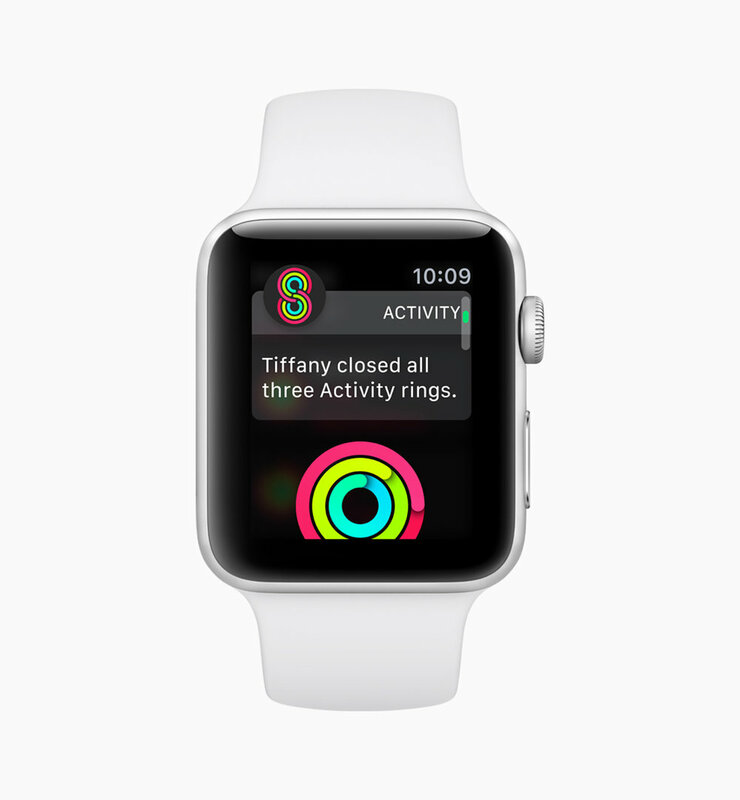 Automatic workout detection means that your Apple Watch will keep recording your activity when you're working out. This feature works with Outdoor Run, Indoor Run, Outdoor Walk, Indoor Walk, Elliptical, Rower, Pool Swim and Open Water Swim. With watchOS5, you can challenge friends to fitness competitions, win awards based on your activity points and closing rings with the new Competition option. You will also receive regular progress reports to help you see where you stand in relationship to your friends, motivating you to workout. Apple Watch now has a new pace alarm for outdoor runs in watchOS 5 that helps users know if they are ahead or behind their designated target running pace. Apple's watchOS5 introduces two new metrics, cadence or steps per minute metric for both indoor and outdoor runs and walk, and the rolling last mile that shows the pace for the last preceding mile. Previously, Apple had integrated workout tracking from popular gym equipment such as treadmills, bikes and elliptical machines for more accurate individual workout statistics. One of the best new features of watchOS5 is Walkie-Talkie. With watchOS 5, Apple introduces Walkie-Talkie, a new way using a popular old name that immediately conjures up understanding of having a personal one-on-one communication method. Just like a traditional Walkie Talkie, Walkie-Talkie uses press-to-talk communication to connect you to your friends and family. Walkie-Talkie works with just your voice and a tap of the wrist, helping you get in touch with friends and family quickly. The feature can be activated between any compatible Apple Watch users over Wi-Fi or cellular anywhere in the world! We look forward to testing this feature out. We are very happy to see this integration as we are launching our new podcast Stardust this year at last! It was on our wish list for WWDC 2018 and was fulfilled! With watchOS5, Apple's popular Apple Podcasts app comes to the Apple Watch. You can listen to any podcast on the go, streaming using the catalog available via Siri. New episodes sync to your Apple Watch and automatically update to your latest episode. Apple also offers third-party integration for music, audiobooks and meditation sessions from Pandora, Audible and 10% Happier that can be played back offline without needing access to the individual user's iPhone right away. Siri on the Apple Watch has improved, with more predictive shortcuts using machine learning to act as a better personal assistant, using information gathered from your routine, location, workouts, heart rate and other details. You can also see informations such as sport scores or commute time using Maps, as well as content from Citymapper and Nike+ Run Club. Notifications are now smarter and interact more, allowing you to check into a flight, pay for a ride and book a table at a restaurant with a wrist notification. You can use third-party apps appear now through watchOS5 with interactive controls so you do not have to use the full app. With Webkit integration, watchOS5 allows you to view some website content from apps like Mail and Messages. You can click on links and load sites right in Apple Watch. While it is not full Safari support, it does let you more than prior versions. Another cool feature with the Apple Watch is replacing Student ID cards. Students can just raise their wrists and gain immediate access to different campus areas such as the library and dorms and to attend events. By adding their ID cards to the Wallet on Apple Watch, they can also pay for snacks, laundry and dinners around campus. This feature has now launched on several college campuses including Duke University, the University of Alabama and the University of Oklahoma. It is slated to be available to Johns Hopkins University, Santa Clara University and Temple University later this year as well. As a free update for Apple Watch Series 1 and later, watchOS 5 will be available soon this fall. It requires iPhone 5s or later using iOS 12. Along with watchOS5, Apple has also introduced a range of new bands and colors. Later this fall, Apple is also expected to release the Apple Watch Series 4. We love the improvements that have been made to watchOS. In future versions, we would like to see an update to the Apple Watch itself so it could handle external weather and varying circumstances more easily. Basically, it would be great if the watch was more rugged and comfortable getting wet or having snow falling on it. It is a beautiful piece of hardware and we are hesitant to push it too far. Having more rugged outdoor protection of some kind would be great to see. Also we would love to see Apple have its own Apple Watch community similar in concept to Fitbit's, but uniquely its own. We think that is an area that Fitbit really shines. We love the detailed statistics and real-time information, helping you pick out workouts and stay motivated. At Elf, we are always excited about new updates to the Apple Watch. See our prior 2016-7 Apple Watch we developed here. This is a budding ecosystem that we are happy to contribute to and to explore as it continues to evolve. Thanks for reading!